Marlin fishing is not for the faint hearted. This is big game fishing and it requires strength, knowledge (of both your tackle and of the fish), desire, tenacity, love of the sport and money. That said it is one of the most exhilarating, exciting, adrenalin pumping things you will ever do! There are several excellent marlin fishing sites around Australia on both the east and west coasts but none better than along the edge of the Great Barrier Reef between Cairns and Lizard Island. During the season of September through to mid-December, anglers from all over the world arrive to target the infamous Giant Black Marlin. 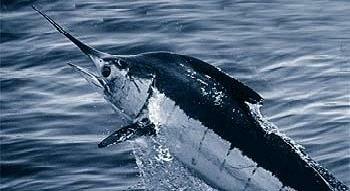 I remember radio and TV legend Bob Dyer and movie actor Lee Marvin, both famous as big game fisherman, would rave about the black marlin fishing around Cairns and the Whitsundays. In fact Cairns is the Mecca of all game, deep sea and sports fishing, not only for Australia but around the world. It is without doubt the best place to catch a black marlin over 1000 lb. 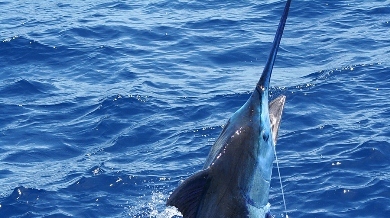 Marlin fishing on the Great Barrier Reef will open your eyes to a whole new world of heavy tackle, hard-core game fishing. Because the Great Barrier Reef is about 50 kilometres offshore most charters are set up so you can live on board for 3 days or up to a week or more. This means more time is spent fishing and less time running backwards and forwards from shore. Living on board also allows you to move up and down the reef to the most productive areas. Alternatively you can take the day trips from Lizard Island where the Island and its world famous resort are only 20 minutes away from the fishing grounds. It's an attractive option to stay in the Luxurious Lizard Island Lodge and do day trips out to the Reef. Many anglers utilise the Lodge as a base from which non fishing partners can also enjoy the location and all its activities. Another option offered is to charter a Mothership as well as a sport fishing boat. Motherships ranging from 65 to over 100 feet in length ply the reef during the Black Marlin season. The Mothership has a Chef and staff to provide meals, accommodation and recreational activities for Charterers. The sportfish boat ties alongside the Mothership at night and the Charter party is transferred on board for dinner and a comfortable night's sleep. The Mothership/Sport fishing boat combination can move in concert along the 160 miles of Reef to always be in the best location. Another famous marlin fishing area is the home to Australia's largest inter-club tournament which is held during February and March each year at Port Stephens on the northern coast of New South Wales. Port Stephens is a very popular Sport and Game Fishing area and this tournament is regarded as the biggest in the Southern Hemisphere. Marlin averaging 300 to 500lb are quite prolific in this area with all 3 species of billfish, black, striped and blue marlin available and the good chance of a Grand Slam, or landing the 3 species in one day, is very high. 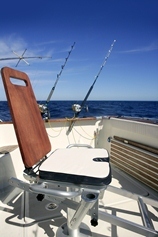 Other popular areas for marlin fishing in Australia include the Gold Coast in Queensland, which has the best score in terms of numbers, and Sydney in New South Wales. In Western Australia, Rottnest Island off Perth, Exmouth and Broome in the northwest all have flourishing marlin fishing tourism industries. Due to modern technology it is now much easier to firstly join and take part in a marlin fishing excursion and to actually hook one and bring it in. There are many boat charters available, often designed to super luxury standard, being offered with the very latest equipment including cutting edge electronics, newest fighting chairs, flying bridges, and navigational aids. Training is also offered to ensure a successful trip. Most charters have a 'lookout' high in the tower looking at the sounders and sonar to 'mark' the fish and watch the baits. Almost inevitably he/she will see the fish before anyone in the cockpit and will inform the anglers and crew of what is about to happen. If you're a first timer or even an experienced angler, the crew will ensure you are guided and instructed on how to fight a fish from hook-up to release. When hiring a charter boat be sure to look for one offering video coverage. Most of these boats are now equipped with cameras which can record activities on board each day and at the end of the trip, guests have a DVD with everlasting memories of their thrilling experience. Just finally, a word on value. As I mentioned before, marlin fishing is not a cheap hobby or pastime. A charter boat can cost anywhere from $400/500 per day through to several thousand dollars per day but there are many options and good deals are always available. If you're planning a big game sports fishing tour 'down under' our advice is shop around for the best deal and find something that will suit you at the price you want to pay.